We have a surprise contender entering the Album of the Year competition for 2009. Welcome again to the Big Boy Table™, Mark Knopfler. I don't know why it should be a surprise – least of all to me – but "surprise" is just one of many superlatives to heap upon Get Lucky. What makes it such a surprise? It's not like he drastically altered his sound, continuing to mine familiar sonic ground with folk, Celtic, blues, country, and Americana elements quilted together to form the recognizable tapestry of a Mark Knopfler record. What makes this stand out is the way he weaves these elements together. The trouble for Knopfler is that he's been doing that so well and so consistently ever since parting with his more famous band, Dire Straits. Careful listens to his solo records reveal he has been a consistent craftsman of impeccable taste and skill. That consistency can be misinterpreted and used against an artist. Albums can be difficult to distinguish when similar blueprints are adhered to and the quality rarely waivers. What separates Get Lucky is the quality of his ideas. He continues to blend these musical elements in his unique style and filters them through his musical past. When an artist gets self-referential, they run the risk of becoming a self-parody. Sharp, vivid lyrics and fully realized compositions combine with outstanding contributions from his collaborators, creating an album that stands tall among his career accomplishments. 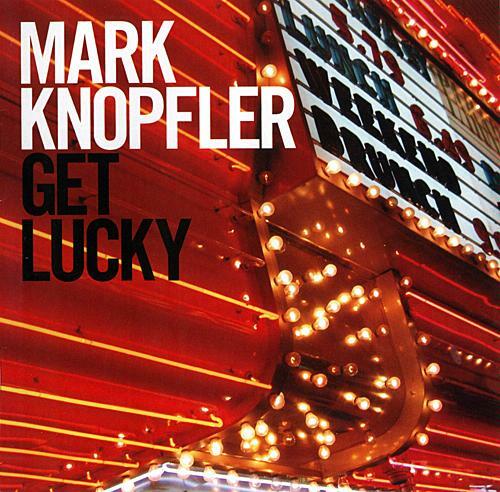 Get Lucky finds Knopfler in a contemplative, reflective place. In the liner notes, he provides some commentary about several of these songs. They are filled not only with the warmth of familiar sounds but the bonds of family and memories of childhood. "The Car Was The One" was inspired in part by racer Mark Donohue. Knopfler found a kindred spirit in the late driver. Donohue's passion to race as expressed in his autobiography reminded Knopfler of his own drive as a young man to be in a rock band. Musically, "Car" has shades of "The Fizzy And The Still" from his previous record Kill To Get Crimson. "Monteleone" also has DNA from Kill To Get Crimson, referencing the folk-waltzes of "The Scaffolder's Wife" and "Heart Full of Holes." Guitar maker John Monteleone, who made one for Knopfler, inspires the song. It isn't about blueprints or manufacturing but about the heart of an artist and craftsman. "Cleaning My Gun" borrows from a song a little earlier on his solo career, referencing the music of "Song For Sonny Liston" from his excellent Shangri-La record. "Before Gas And TV" doesn't have a specific song reference, but its sound sits comfortably within Knopfler's usual territory. It's a Celtic folk song imbued with Americana, familiar territory for him and his audience. He never sounds like he's repeating himself even if many songs in his catalog do fit that description. "Can't Beat The House" finds him playing latter-day Dylanesque blues. Imagine Dylan re-recording "The Groom's Still Waiting At The Alter" for his Modern Times or Together Through Life records and you have an idea of where "House" dwells. This is a subdued blues and the lead guitar doesn't have the same distinctive tone as his most famous solos. The licks are still as tasty as anything he's ever done, but the seasoning is different. He should flag this song in his memory and come back to this style again. His consistent excellence puts greatness within his grasp and he's damn good the rest of the time. With a mix of new and familiar sounds and a batch of some of his finest stories, Get Lucky is a timeless record that puts great in the rearview mirror.